Continuing with the theme, today’s snapshot was taken on Alcatraz island, as I slipped away from the group tour and started exploring out on my own. Ducking through a side-door and out onto what used to be the inmate recreation area, this guard station served as the watching point for the entire yard, 50 feet or so below. The view is incredible even from where I stand, but must have been absolutely stunning from up there. Full 270° views of San Francisco, the Golden Gate Bridge, and the whole western Bay. Although, never mind being locked up inside… looking over the concrete walls, and out over the water to the fun being had just a short mile away, must have felt extremely isolating for the prison guards. 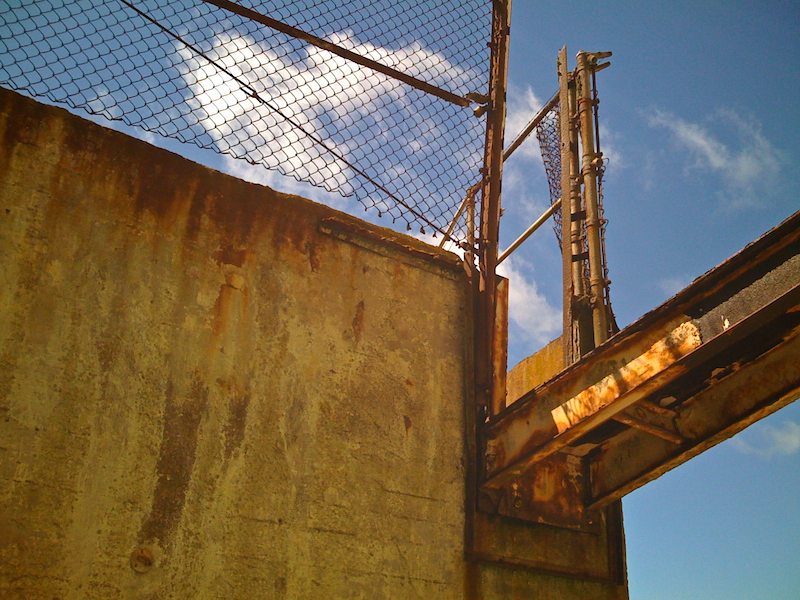 I love the texture of the old rusty steel beams, wind-whipped chain-link fences, and weather worn cement; against the tame crystal blue sky. Taunted with the single, whispery-soft cloud floating by… tricking us into believing that Mother Nature isn’t actually responsible for their keen destruction. Awesome shot kc! I look forward to your brilliance every morning! Thank you!